Last night I made something sweet for our 6th “sugar” wedding anniversary. This was the first thing I ever cooked for my now husband, Jay Jay. He rather romantically remembers it as the evening he fell in love with me…..the cynic would perhaps add that he was single, hungry and living with his Mum. It’s a pretty easy recipe and very delicious but it does take a bit of time. When cooking it yesterday, I was reminded of a time when I too was single, without children and had literally HOURS to spend reading recipe books and cooking lovely things. This time around it was all a bit of a rush and we ate rather late. So here it is, the basic recipe is from a book called Notting Hill Cookbook by Carina Cooper which is far from being one of the greatest cook books ever written but this tart makes it almost worth while. Really it’s just an apple tarte tatin but made with onions instead of fruit. There are variations on this recipe all over the internet so you may well find an easier one – I stuck with my original for reasons of sentiment, but also added thinly sliced goats cheese and a little bit of rocket to make it look pretty. The main part of this recipe is taken straight from the pages of Carina’s cookbook – the words in itallic are my own additions and interpretations. You need a heavy cast iron frying pan for this or just one which can go in the oven. Preheat oven to 220 C / gas mark 7. Melt the butter in a frying pan on the hob and add the olive oil. Add the onions making sure they fit cosily in one layer – I cut them in half and put the flat side down to begin with. Sprinkle with the sugar, salt and rosemary. Turn the onions until they are slightly caramelised and then add water up to the top of the onions. I end with the onions on their rounded side down before I add the water. Bring the onions to simmering point and then let them cook until all the liquid has evaporated (about 10-15 mins) leaving a lovely sticky glaze. Roll out your pastry thinly to fit the top of the pan and then lay it over the onions and tuck it down snuggly round the edge of the pan. Bake in the oven until the pastry is golden brown (about 15-20mins). Now, Carina takes the pastry off and then scoops the onions out and lays them on. I put a plate over the pan and tipped the whole lot over and it came out beautifully. That way you keep the shape of the onions and it looks like a proper Tarte Tatin. 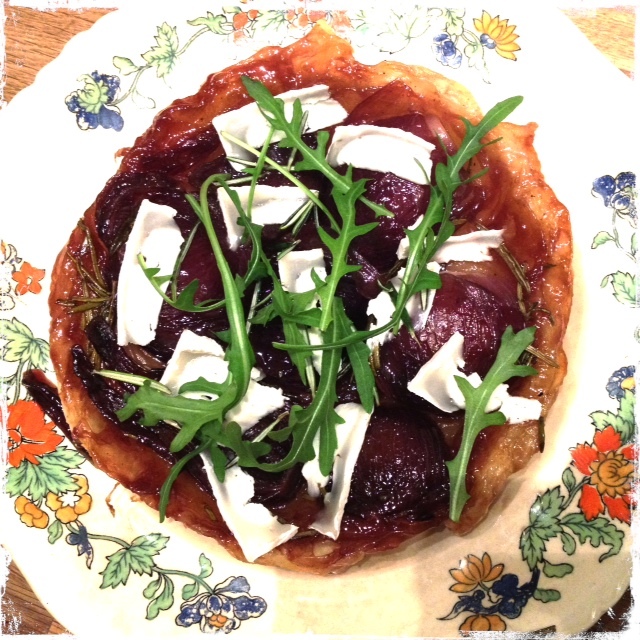 Once your Tarte is nicely turned out on a plate, finely slice some goats cheese and sprinkle on the onions. Add a bit of pepper and a few sprigs of rosemary if you like. Rocket leaves look rather nice too. I served it with a green salad with balsamic, olive oil and mustard dressing. It worked beautifully…I reckon we might make 7 years thanks to this Tarte.